Expansions and contractions in global trade have played out over long secular trends for thousands of years. The Silk Road, for example, was established by the Han Dynasty of China in 130 BC, and allowed for continuous trade between East and West for nearly 1,600 years. 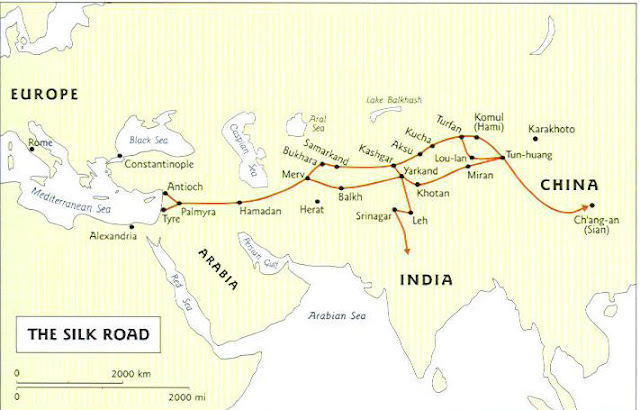 In addition to economic trade, the Silk Road was also a conduit for culture and knowledge among its network of civilizations. However, this trade route eventually came to an end. When the Byzantine Empire fell to the Turks in 1453 AD, the Ottoman Empire closed the Silk Road and cut all ties with the west. Geopolitical trends turned inward towards isolation. In more modern times, global trade has been conducted by shipping cargo across the international waters of the high seas. Over the last 200 years trade cycles have often expanded for such lengthy periods that several generations will come and go while only knowing this half of the trend. During these episodes people come to believe increased global trade is a linear phenomenon. In many parts of the world, you’d have to go back to before 1960 to find someone with living memory of a global trade contraction. In the United States, Japan, and Western Europe this is certainly true. In China, the current trade expansion began in the 1970s and in Eastern Europe it began in the early 1990s. Those willing to look back to the first half of the 20th century will discover that global trade, as a proportion of total economic activity, went down between the onset of World War I and the 1960s. That’s a near 50 year run of declining global trade. What’s more, at the moment, it is very well possible that we are in the early stages of another long-term contraction in global trade. Global trade over the centuries – pre-19th century data are subject to a lot of uncertainty, but even in the distant past there were lengthy periods of expansion and contraction. 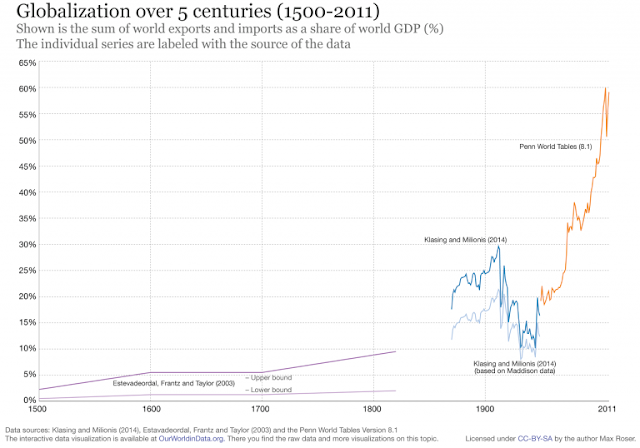 Global trade expanded enormously during the “Gilded Age”. The trend ended abruptly with the beginning of WW1 and reversed sharply. At the time it was widely held that a war between the big powers was impossible due to the high degree of global economic interdependence. This turned out to be an error – and it took a long time to bring international trade and economic cooperation back on track – the volume of trade recorded in 1910 was only surpassed in the mid 1970s. It goes without saying that growing trade and growing prosperity tend to go hand in hand, but post WW2 growth is distorted by the fiat money system and the huge credit expansion it has fostered. The fact is, as noted by the globalization index of KOF Swiss Economic Institute, “The financial crisis of 2008 not only put a stop to the extensive economic integration that had lasted since the 1990s but even reversed it to some extent.” In general, global trade has been flat for the last decade. Of course, with today’s debt based economic growth model, when an expansionary trend stalls out, the debt quickly piles up beyond what’s serviceable. Earlier in the week, from the vantage point of our hometown shore front in Long Beach, California, we bore witness to the stall out, and possible reversal, of global trade. More on this in just a moment… but first, some context is in order. Certainly, there are many great monuments to globalization that have been erected over the last 50 years. Vast consumer outlets, Costco box stores, and an abundance of Walmarts across the land. But perhaps no place captures the psychosis of the era better than the mammoth Port of Los Angeles / Port of Long Beach complex. Here in our slice of Americana sits the very place where the manifest destiny of western civilization finally ran out of land. The concrete and steel collides with the Pacific Ocean at the Port of Long Beach in a breathtaking array of container terminals, cranes, and freight transport facilities. East meets West in the fiat money debt fueled reciprocation of China Shipping and Hanjin Shipping vessels rigorously stacked with containers carrying gewgaws and garments. If you haven’t heard, on September 1, Hanjin Shipping of South Korea, the world’s seventh largest shipping company, filed for bankruptcy protection in a Seoul court. Shortly after, ports and terminals around the world – including Long Beach – denied access to Hanjin ships and refused to move their cargo because of concerns Hanjin won’t be able to pay its bills. One report we came across projected that it will cost upward of $90 million to unload the stranded cargo ships. With each passing day there have been rumors that an agreement is just one day away. As of this writing, we are unaware of one actually being reached. Ponying up the dough for a company that has been operating at a loss since the end of 2015 and is set to lose about $5 billion this year, isn’t a risk worth taking. On Wednesday evening, as part of a family outing for ice cream and a leisurely stroll among the crusty fellows casting their lines off Belmont Veterans Memorial Pier, we witnessed the cascading effects of a debt breakdown with our own eyes. Offshore, in the near waters of San Pedro Bay, framed by an incandescent sunset dipping behind the Palos Verdes Peninsula, drifted several marooned Hanjin vessels. They were stacked to the hilt with containers that were, no doubt, full of plastic skeletons and light up Jack O’lanterns. Indeed, this could be a grim symbol of a serious onset of de-globalization. What a shame, all the creepy doodads may never make it to a big box store near you. About the Author: MN Gordon is President and Founder of Direct Expressions LLC, an independent publishing company.